All Balls Racing bearings seals starters and conversion packages all the needed parts to help with rebuilding your ATV, Dirt Bike, Street Bike, V-Twin. All balls is our choice for quality steering head replacement bearings. weathe your replacing your stock head bearings or you are converting your front suspension All Balls gets the job done right with superior performance. Usr the All Balls fork conversion app to find the correct bearing configuration regardless of what manufactures front end or which motorcycle frame you choose to use for you project. All Balls Racing supports riders and teams all over the world from local level amateurs to top level champions. By working closely with riders they are able to continually stay at the forefront of product design and development. Because there is a direct link between the riders and their development facility, they are able to make quick adjustments during the R&D process and ultimately have a better product come to market. All Balls starter motors are manufactured with all new components that have been fine-tuned for starting the H-D V-Twin engine. Our clutches utilize 20% oversize rollers, and the idler gears are manufactured from cold-headed steel. End frames are cold-chamber die cast and machined on precision fixtures. Armature hairpins are resistance-fused to the commutator. 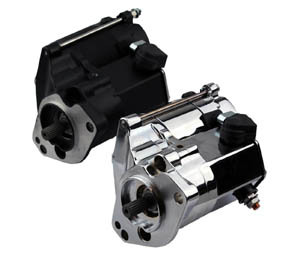 All starters are supplied with a 10/32 threaded output shaft, and a conversion bolt for the earlier 1/4-20 threaded output shafts to cover all Big Twins from 1989 thru 2005. 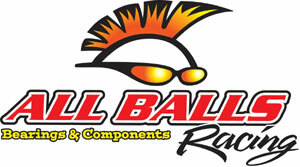 We at Bikes Built Better all have All Balls Starters installed on our Harley's and Buells. All Balls has helped many of our customers with Big Bore difficult to start customs get reliable and consistant starting for their big motor Harley Davidson or custom choppers with after market big bore motors.